Some stadium concession stands are hitting it out of the park for gluten-free fans. Baseball lover and G-Free Foodie K.C. Cornwell shares where to find major league eats at our nation’s most GF-friendly ballparks. 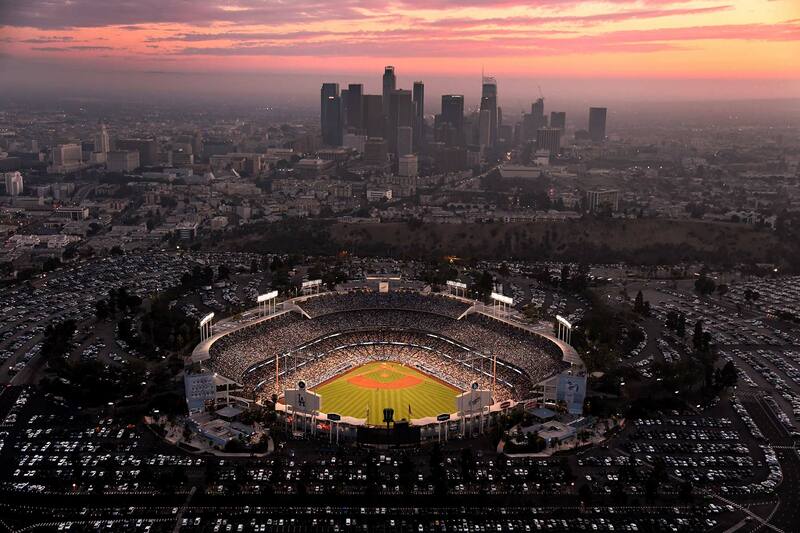 ATTENDING A BASEBALL GAME ISN’T JUST ABOUT THE SPORT, it’s about the experience. From the moment you pass the scalpers outside and wade into the sea of fans swathed in home-team colors, you’re a part of something bigger. A ballpark is one of the few places where it’s still socially acceptable to scream in unison while waving a giant foam finger and high-fiving folks you’ve never met. It’s also where ballpark food plays such an integral role—the song everyone sings at the seventh inning stretch references peanuts (usually safe) and Cracker Jack (made on shared equipment, no gluten ingredients). Of course, there’s more to ballpark food than that, especially nowadays. 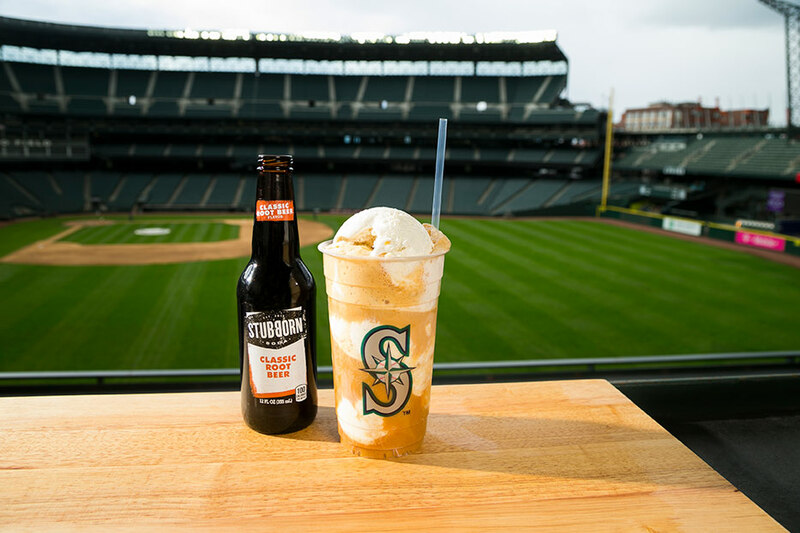 Along with the requisite hot dogs, popcorn, and beer, most stadiums now offer a few favorite regional specialties, and many fans plan their visit around what they’re going to eat. It’s as much a ritual as the rally cap (a baseball cap worn in an unconventional way to will the team to a last-minute comeback). While sitting in a plastic seat for many hours surrounded by people devouring giant sausages with grilled peppers and three-cheese nachos served in plastic batting helmets is part of the ritual, subsisting solely on bottled water and sunflower seeds shouldn’t be. Fortunately, the following baseball parks are bringing their A game so when it’s time for that beloved mid-game stretch, gluten-free fans have much more to sing about than roasted in-shell nuts and caramel-coated popcorn. Located along the eastern edge of San Francisco, with a glistening blue bay backdrop complete with kayakers bobbing in wait for water-bound homers, this ballpark celebrates the city’s love for food—and gluten-free options. 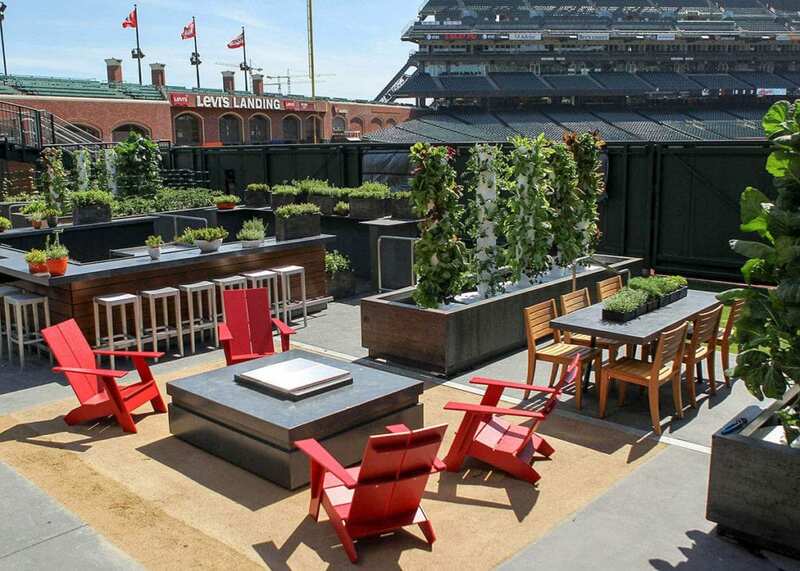 Check out The Garden, a section located behind the centerfield wall that houses two restaurants and a bar surrounded by garden beds and aeroponic towers: Hearth Table’s menu is entirely gluten-free, offering an all-beef hot dog and bun with housemade relish, seasonal salads, and flatbreads topped with ingredients grown right there (don’t miss the housemade fennel sausage with roasted eggplant, caramelized leeks, and goat cheese). Garden Table offers vegetarian and vegan items like smoothies, soups, and salads, some of which are also gluten-free. The Garden’s bar has GF cider on tap. GF hot dogs and buns can also be purchased at the Budweiser Brew Pub in section 112, and fresh fruit, seafood salads, and more can be found at the Farmer’s Market Cart on the Club Level. Redbridge gluten-free beer, Ghirardelli ice cream, hot chocolate, and hand-tossed caramel corn are available throughout the park. Note: You can bring your own food inside the park, no questions asked. 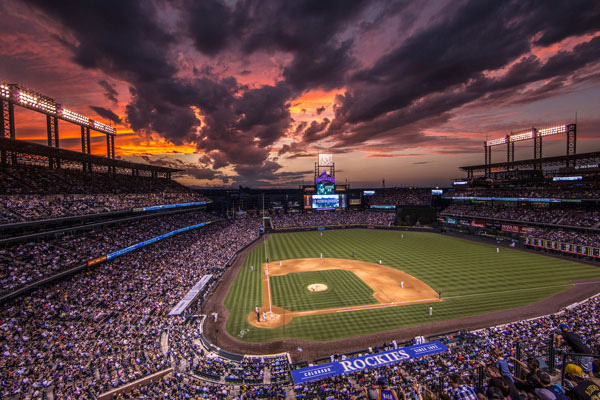 Located in the heart of Denver’s LoDo neighborhood and surrounded by shops, restaurants, brewpubs, and mountain and city skyline views, Coors Field was the first ballpark to put in an exclusive gluten-free stand, still located in section 147. It offers hamburgers, hot dogs, and chicken sandwiches on gluten-free buns, and cookies, plus grilled-to-order vegetarian quesadillas. You’ll find gluten-free beer here, too. Look for fresh salads at multiple locations. 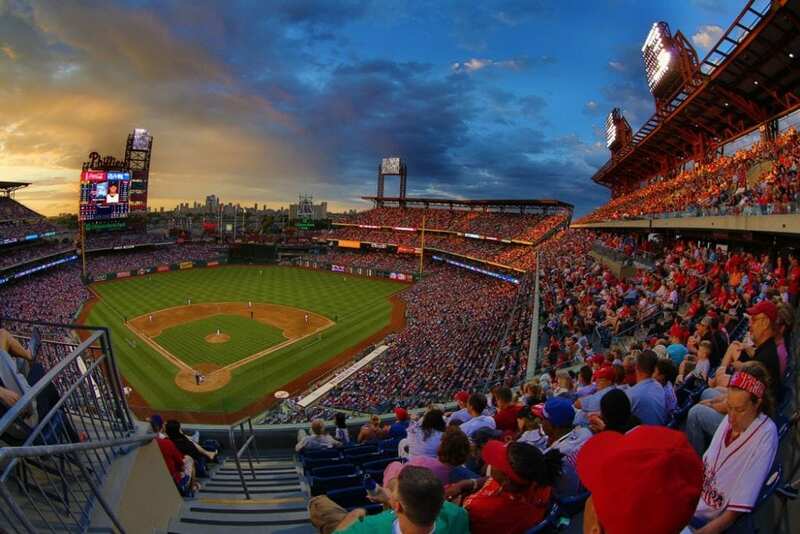 Also home to the Philadelphia Flyers hockey team, Philadelphia 76ers basketball team, and Philadelphia Eagles football, the Phillies’ ballpark, in South Philadelphia, is one of the most hitter-friendly in baseball. Here, gluten-free regulars go straight to the gluten-free concession stand in section 122 for real-deal GF cheesesteak, hot dogs, pizza, cookies, brownies, and soft pretzels. Legendary Chickie’s & Pete’s, at several ballpark locations, offers crab fries, cooked in separate fryers, that come with the requisite cheese sauce. Redbridge beer, Angry Orchard Cider, and local favorite Hardball Cider (try the Splitter!) are available throughout the park. Look for Caesar salad sans croutons and three-bean chili at Harry the K’s Broadcast Bar & Grille, Rita’s Water Ice throughout the park, and locations offering Redbridge beer and Stella Artois Cidre. 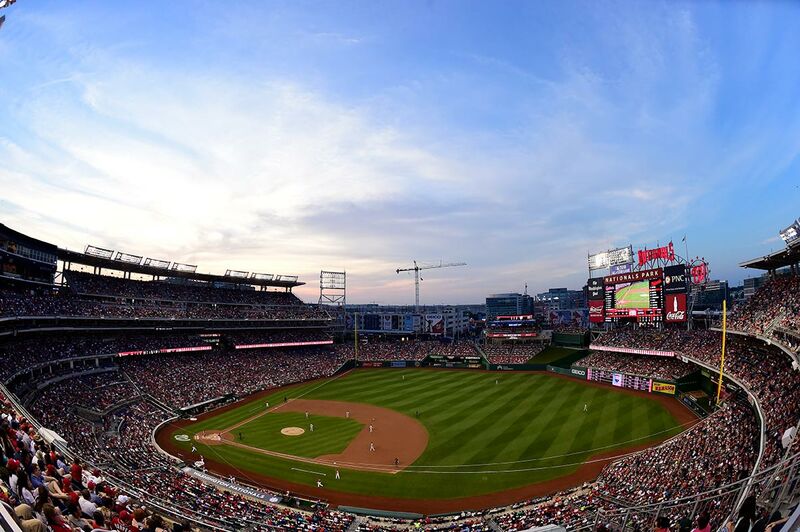 Surrounded by parks, restaurants, museums, a trapeze school, and the Anacostia River in Southeast Washington, DC’s ballpark is known for its comfortable seating, river views, easy access from public transportation, and twenty-two price levels for seats, including a $5 grandstand option. For a menu packed with safe ballpark favorites, visit the Gluten-Free Grill (yes, really! ), just left of the main gates, for Italian sausages, hot dogs, and pulled pork served on GF buns, as well as pizza, nachos, and GF beer. You can also score white cheddar popcorn and bagged Clean Snax from Melissa’s Produce. Note: You can bring in your own food, as long as it is packed in single serving–size bags and stored in a soft-sided cooler or container. The oldest Major League ballpark west of the Mississippi River, “Dodgertown” (seriously, it has its own zip code) is located in central Los Angeles. 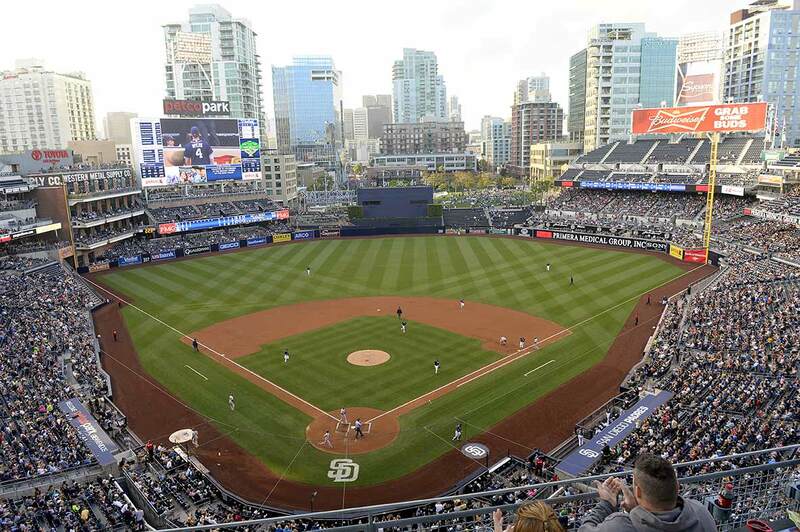 The 56,000-seat stadium may have been built in 1962, but it’s consistently upgraded, so there’s new lighting, scoreboards, and restaurants, and club areas recently got new seats with USB charging stations. Visit the gluten-free cart in section 137 for a Dodger Dog on a gluten-free bun, along with an assortment of snacks, sandwiches, salads, and fruit or veggie cups and gluten-free beer (also offered at locations throughout the park). If you’re looking for a that’s-so-L.A. moment, you can order sushi at multiple locations, but you’ll have to bring your own GF soy sauce to stay GF. Also look for Healthy Carts offering fruit, salads, and snacks. The heart of downtown Minneapolis is known as Twins Territory, where the team plays on a field with city views, pitchers warm up in a double-decker bullpen, and fans have several GF options. Minnie & Paul’s in section 234 serves up gluten-free pizza from Pizza Lucé, and the Hot Indian Foods cart in section 120 has a chicken tikka rice bowl or salad, and a GF tofu vindaloo bowl. The Grab-n-Go stand in section 112 has gluten-free sandwiches, salads, fresh fruit, and veggies with dipping sauce. For a sweet treat, look for Izzabella Gelato stands in sections 119 and 302 and the Delta SKY Club. Also, there’s Twins Dogs (skip the bun) and soft-serve ice cream throughout the park. Bordered by the local trolley line and within walking distance of dozens of restaurants, bars, shops, and pubs, this park, in downtown San Diego’s East Village, offers tons of gluten-free dining options. Visit the Seaside Market in section 107 for GF hot dogs, pizza, beer, seasonal salads (ask which are GF), and look for burgundy-pepper tri-tip nachos throughout the park. At Board & Brew Specialty Sandwiches in section 205, every sandwich can be made in a GF wrap. The park’s various taco stands offer an option or two, and Redbridge GF beer is available at all Budweiser stands. Also look for ceviche and lettuce-wrapped burgers at Wonderland Ocean Pub (section 307), oysters Rockefeller at Brigantine Seafood & Oyster Bar (section 208), baby back ribs at Phil’s BBQ (section 113), and Mister Softee Soft Serve. In addition to the amazing Seattle skyline views, an umbrella-style retractable roof, and an abundance of public artwork (including a chandelier made of 1,000 resin baseball bats above the home plate entry), Safeco Field is known for great game views and GF options from all locations. Gluten-free Mariners fans can enjoy Poquitos Mexican favorites at Edgar’s Cantina, located at The ‘Pen and at Edgar’s Tacos in sections 151 and 212. Both serve tacos or nachos with carne asada, carnitas, grilled chicken, or mahi mahi. Poquitos is home to another safe local favorite: toasted grasshoppers (chapulines) coated in chili-lime seasoning. But you’d better be quick if you want to get your hands on those crunchy critters—only 312 orders are available per game, and they sell out fast! Also, look for a hummus plate and salads at The Natural (section 133) and ice cream floats at Frozen Rope (section 132). 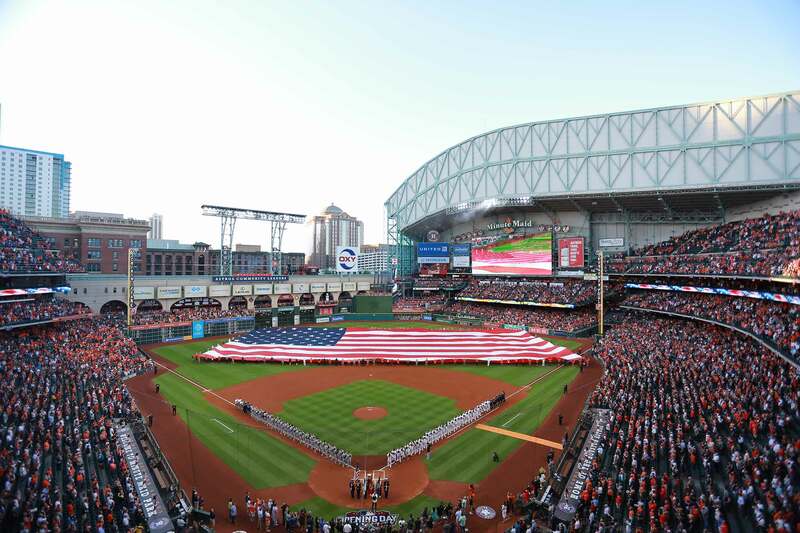 The Astros, the current World Series Champions, play on a natural-grass field protected by a retractable roof in downtown Houston, where the fans are serious about baseball and food. Gluten-free fans can enjoy carved BBQ brisket, smoked turkey, and a BBQ baked potato bar at The Butcher (section 224) and at Texas Smoke (sections 125 and 306). Also, look for fresh salads and frozen yogurt at FiveSeven Market in centerfield (section 156) and bunless hot dogs, hamburgers, and sausages and crudité cups and fruit cups throughout the park. Located in the heart of Cincinnati and promising incredible views of the Ohio River, downtown Cincy, and Mt. Adams, the home of baseball’s first professional franchise has lots to offer GF fans. The hometown-famous Montgomery Inn BBQ has an outpost in section 137 and offers BBQ favorites including pulled pork sandwiches, which can also be found at Porkopolis stands in sections 112, 131, and 419. Purchase a GF chicken sandwich at the stands in sections 112 and 419 and hot dogs or nachos in sections 118, 131, and 417. 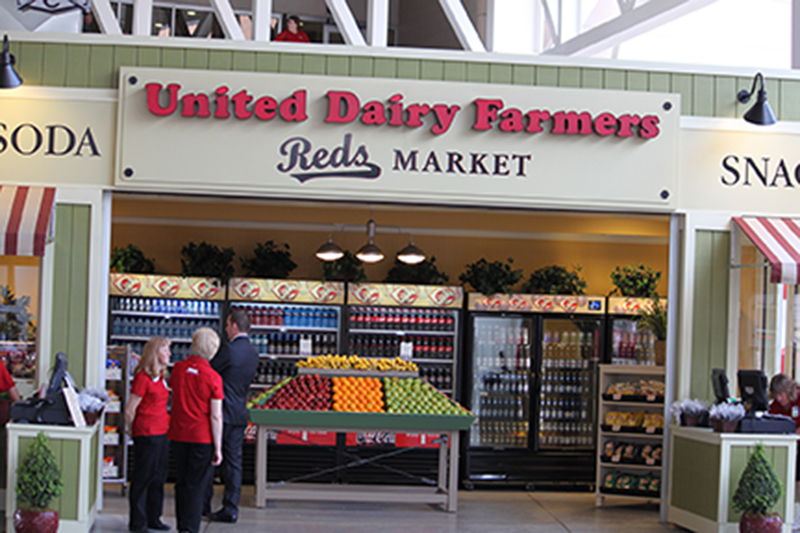 Visit any of the park’s United Dairy Farmers Market stands for fresh salads and fruit. Also look for soft serve ice cream, popcorn, and kettle corn throughout the park. 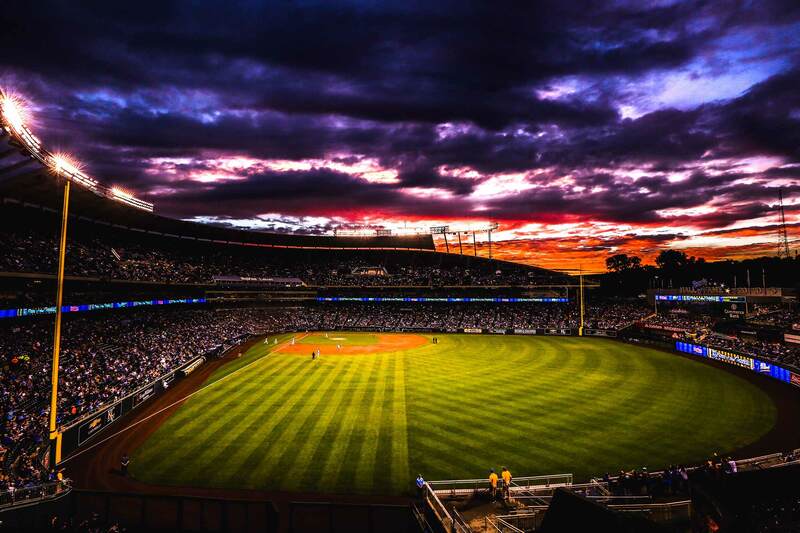 Along with all-blue seats, a “Water Spectacular”—the largest privately funded water display in the world—kids’ zone, high-def scoreboards, and Royals Hall of Fame, “The K” has endless GF options. The Rivals Sports Bar in the Outfield Experience’s section 250 offers nachos, plus GF options for their smoked pepper jack sausage, cheeseburger, and hot dog. In left field in the Outfield Experience, the Price Chopper Marketplace has GF wraps and turkey burgers. Craft & Draft in section 301 serves signature C&D Nuts, smokehouse fries, housemade potato chips, salads, and GF versions of their steak sandwiches and Kobe beef burger. 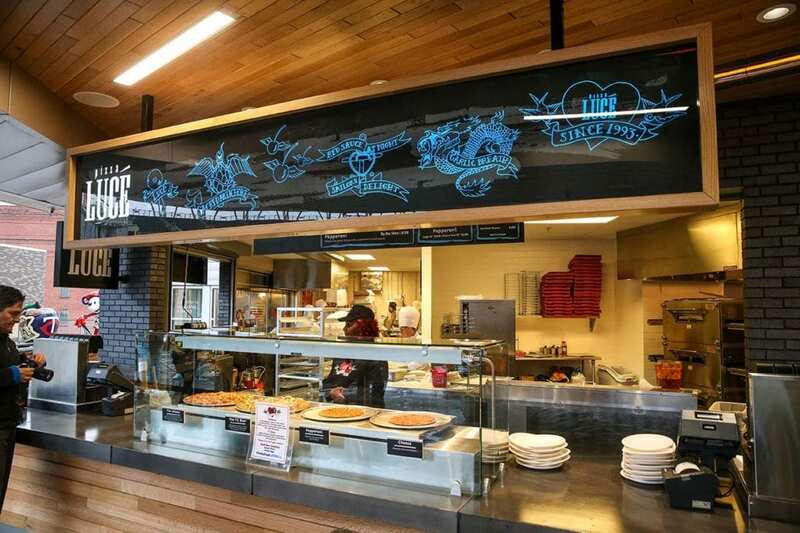 Custom Crust Pizza locations have an optional GF crust, and KC Baking Co. offers gluten-free baked goods and nitrogen ice cream. In the Konica Minolta Diamond Club section behind home plate, fans can enjoy slow-roasted meats, a selection of seasonal sides (there’s always a GF option), and rotisserie chicken from the Diamond Club Rotisserie. Hot dogs, burgers, pizza, tacos, and nachos can be ordered from the Diamond Club Pub or in-seat service. The Bats Crown Club and in-seat service also has GF burgers and nachos, plus daily specials that always feature GF and vegetarian options. Gluten-free beer, cider, and Brisketacho (helmet of brisket nachos) can be found throughout the park. Also look for Exceptional Concession Stands where staff are trained in Autism Awareness and GF options (sections 116, 203, 323). Do you have information re: GF foods at Tampa Bay Rays? Hi Jane! No, we don’t. But we can look into it. Please let us know if you find anything worth eating, too! We’re always on the lookout for more delicious things.